It's a big day for Hana and Kenichi. The two face their graduation exam today on The Island, off the coast of Kyushu in the East China Sea. This would be a memorable time for them based on that alone, but their lives are about to change forever when a mysterious ship reaches The Island's shores, bringing hordes of monsters in its wake. 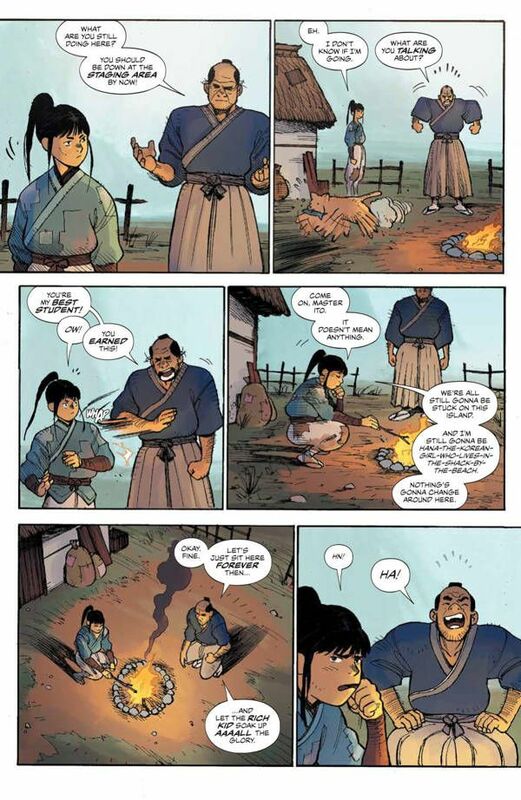 The hook for Ronin Island deals with those monsters, but they only really come in at the very end of this first issue. This isn't much of a spoiler, as it's a big selling point for the series. 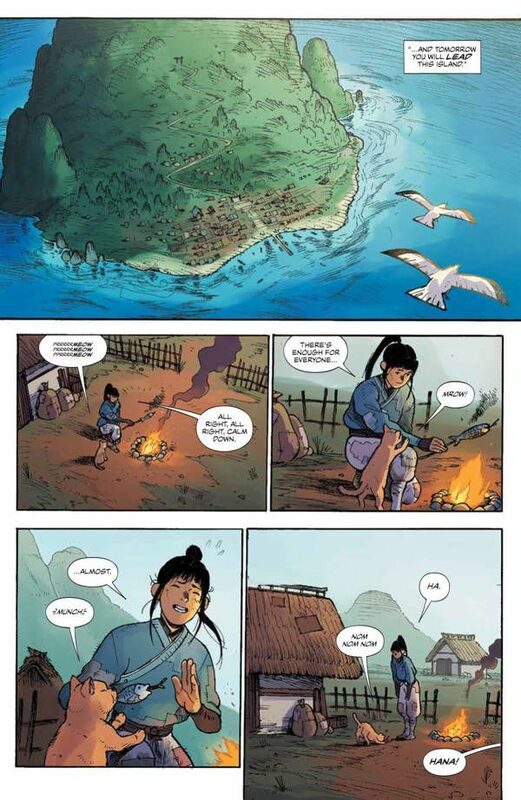 The vast majority of this debut chapter serves as an introduction to these characters, The Island, and this world. 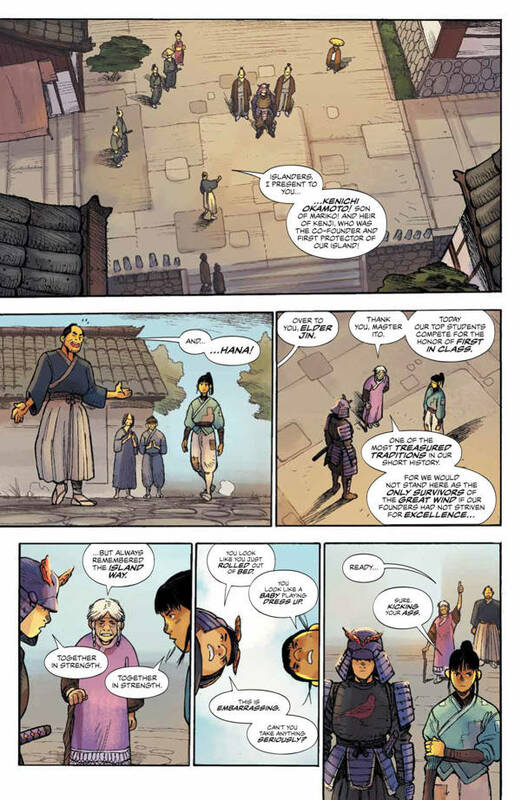 Writer Greg Pak builds a vast mythos very quickly. We're dropped into the lives of Hana and Kenichi and before long are fully invested in everything about them. This makes what is sure to follow all the more harrowing. Now that we actually care about these characters, it's going to be tough watching them fight an army of monsters. The creatures that attack these shores are hideous and deformed. No two look alike, as they all have strange growths around them. Based on their appearance, they might have once been human, but now they're nothing but rough skin, claws, and teeth. We get one good shot of the beasts and artist Giannis Milonogiannis knocks it out of the park. Their reveal is a jaw-dropping moment. Colorist Irma Kniivila gives the scene an ominous tone with a fiery background. It looks like sunset, but it's really coming from fires nearby. This reinforces the rampaging feeling these creatures give off. 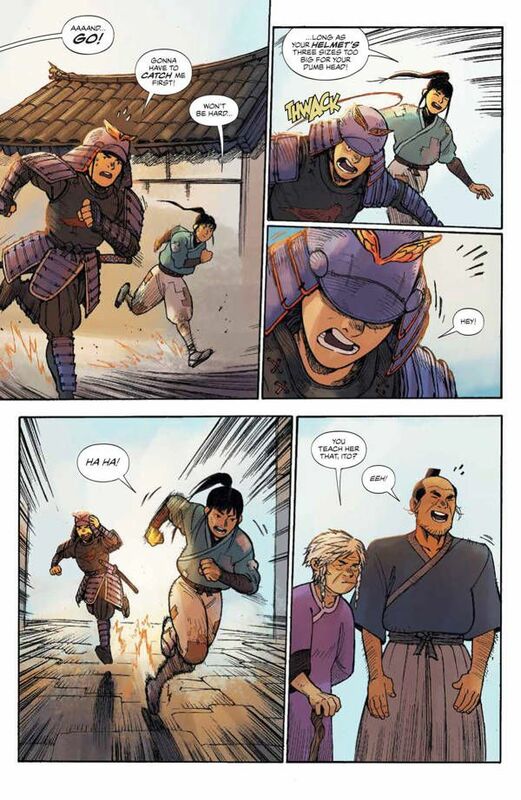 I know I'm spending a lot of time talking about the last few pages of Ronin Island #1. As a horror fan, that's what jumps out, but I want to again point out the solid character work put in before that. Up until the closing moments, this is a peaceful place where nothing out of the ordinary happens. It's a quaint village where these two kids have built up a rivalry, one from the upper class and one from the lower class. It's charming. A great example of this is the exam, which involves them performing a series of physical challenges around The Island. It's not quite Double Dare, but it still looks pretty fun. They poke fun at one another throughout the whole thing. Letterer Simon Bowland bolds some exchanges, emphasizing how they're yelling at each other. It stops short of being truly angry. It's that mock outrage that kids can get when fighting with their friends. 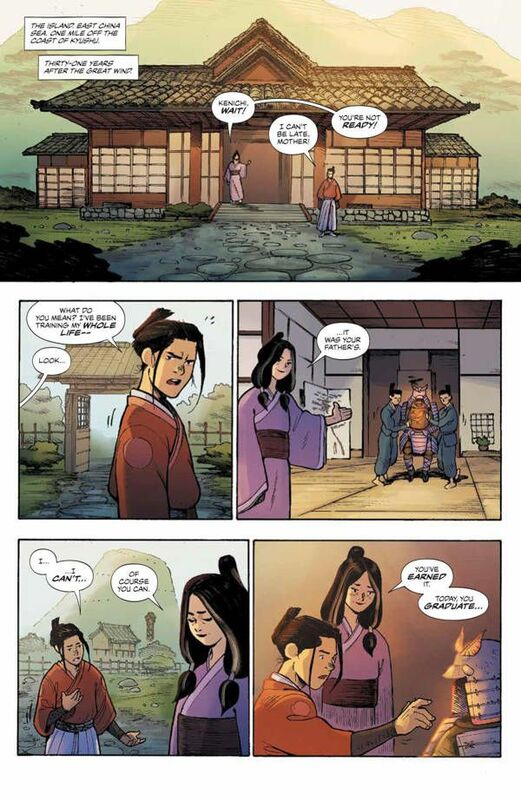 Ronin Island sets a fantastic foundation with this issue. I am pulled in, hook, line, and sinker and I can't wait to see what Hana and Kenichi will survive this oncoming assault from the horde. 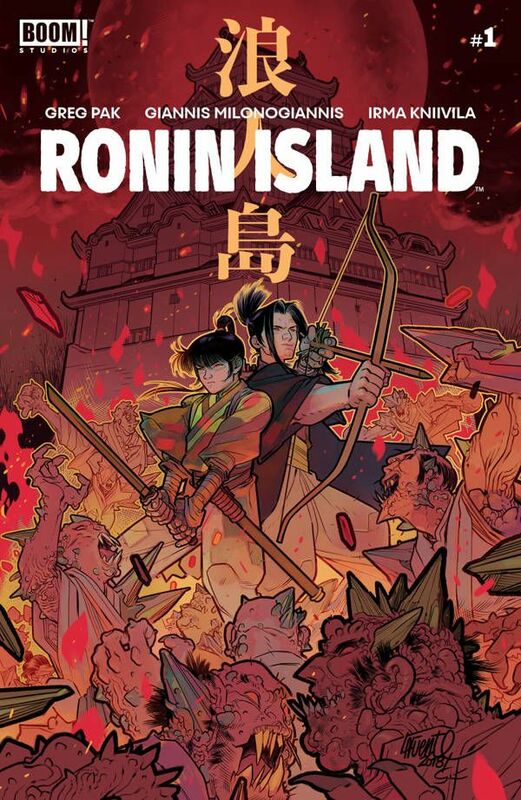 Ronin Island sits in this awesome Venn diagram of samurais and monsters and there's nothing bad about that idea.